Follow Kiwi On: Spotify: spoti.fi/1W8Wa1Q Youtube: bit.ly/1Gm7uWA Facebook: www.facebook.com/kiwidj Twitter: www.twitter.com/kiwi_ldn Instagram: www.instagram.com/kiwi_ldn SoundCloud: @kiwidj Kiwi's riveting Animals EP was such a success across the globe's dance-floors that Duke Dumont's Blasé Boys Club have returned with a clutch of searing-hot remixes delivered by some of the most revered and talented production names on the underground scene; Brassica, Man Power and In Flagranti. Blasé Boys Club are providing an outlet for dance music with less of a pop edge, instead giving fresh talent the room to breathe and develop. Dumont's A&R talents found Alex Warren, a wild gun who's moulding serious dance-floor weapons with everything he touches. 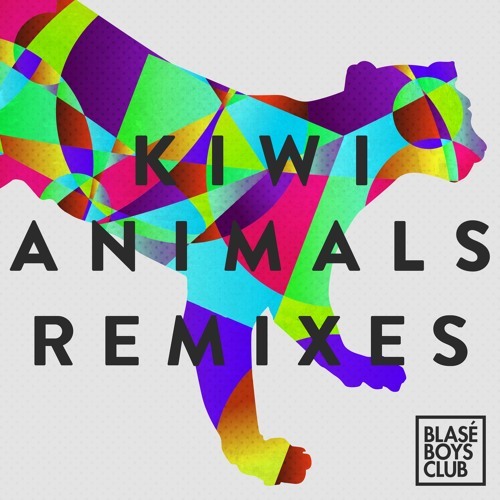 Fusing together elements ofelectro groove and techno stomp across the Animals EP, this new remix package comes equipped with four brand-new versions that stand alone as works in their own right. First up, Brassica turns his attention to Short Tail, stripping back the jack of the original and it's previously galvanized, pulsing bassline. Instead, it's replaced with a healthy injection of rubber, springing and swooping through an eerie tapestry before melodic and uplifting synths drop on the break while driving bass subtly gives the track a solid foundation. Next, Fossa is tackled by inimitable disco house duo In-Flagranti. The US hailing pair bring their effect heavy, percussive layered groove to the EP, with trippy, EQ'd top-line melodies and grooving, percussive slo-mo rhythm, whilst Takura's heavy breathing adorns the track as it gently weaves and cascades through tone and melody. Man Power's Speific State Remix of Atlanticus is a complete departure from it's original guise. Its low- jam, electro breaks and down-tempo composition are changed into a firing, pulsing lazer bass romp. A warehouse track with unrelenting ticks, hisses and driving bassline, this techno beast will be one for fans of recent tracks by Bristol's Livity Sound label and fans of Boddika's output. Rounding off the EP is main-man Kiwi himself, re-rubbing closing track Pelican. It’s tuff original feel is brought down in tempo and pace, retaining it’s Balearic groove but stripping the fluctuating basslines for more whistling melodic rhythms. It’s compressed and tightly wound feel is relaxed on this cosmic- tinged trip, giving it a dynamic and airy feel as the notes find room to breathe and flourish. Super awesome track, only available in itunes?